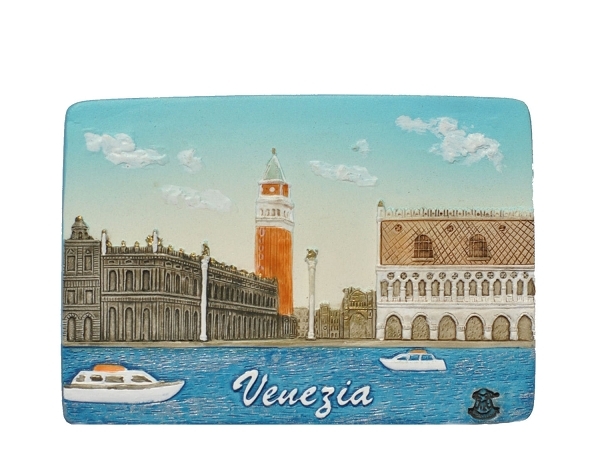 Ceramic embossed fridge magnet featuring a magnicifient view of Venezia Doges Palace together with Campanila of San Marco Cathedral and the waterfront with one of the most busy municipal ships port, taken from a ship sailing over the Grand Canal. Make your fridge to remind you of your stay in Venezia. Elaborated in high detail and fidelity. Made of non-glazed ceramics, hand painted.